I bought the Harman Kardon used on Ebay. I had a Denon that went out on me and needed something else to replace it. I liked the reputation of HK and the looks are pleasing so I rolled the dice. Wow, what a nice sounding unit, I lucked out and am in love with this HK AVR130. A bit of a learning curve setting up, especially without a users manual, but worth it. The remote is mediocre but once you get used to it you stop thinking about it. Two major weaknesses in my opinion.... #1 - The remote control for this unit is horriblly shaped and it could have used illumination for all keypads. #2 - When playing CD's , MP3's and occasionally even when switching from one scene to another in DVD's, the audio lags slightly, causing a dropout of about 1-2 seconds worth of material. This was mentioned in another review and could be due to a delay in the A/D converter. A very reasonably priced receiver for the budding home theater enthusiast. Powerful, lush performance for both movies and music. Ample gusto for all applications. Wonderful sound. Remote could be better (true for most AVRs). Look no further than harman/kardon for your home theater receiver. This unit, "entry-level" only in terms of its position in the h/k line-up for 2004, will outperform most consumer AVRs from the big-box retailers and beyond. The performance is powerful, refined, lush sound for both movies and music, with all the useful 5-channel processing modes. If you aren't looking for more than a 5.1 system, this should be on your audition list. More than likely, it will make its way into your home theater after you've given it a spin. Highly recommended. This unit replaced a Sony ES receiver in my rig and there is simply no comparison. The 130 has more heft, both literally and in a figurative, sonic sense. It lends real authority to movie soundtracks and is sweet, detailed and pleasant in 2-channel stereo operation. The quality of the performance of this unit can really only be substantially bettered if one moves to separates, and even then the return diminishes rapidly as you spend more and more coin. As has been written elswhere, harman/kardon (like NAD, Marantz and Rotel) rates it AVRs honestly and conservatively. They include amps with ample current reserves, so dynamic peaks in soundtracks and music don't make you cringe as the AVR strains to put out the power. This unit will power any and all reasonable real-world speaker loads (4 Ohm speaker owners take note) with gusto, and you will likely have no problem hitting the SPL values you like. The remote is nothing special, but I suspect this will not be an issue for most owners, who will use some sort of universal control anyway. Setup is, in my opinion, no more complicated than is typical for a modern AVR, and there is plenty of flexibility, including a well-developed crossover design. I can't say enough about this AVR. Top marks on all counts, and very highly recommended. Stop reading this. Go buy one. Sony STR-DA2ES, Sony STR-DA4ES (h/k 130 better than both). Marantz 5400 (h/k 130 as good if not better). I can happily associate myself with the favorable comments in other reviews. This receiver is that good. It's very "musical." I am using it with a top-of-the-line, world-class 5.1 speaker array of 2003 Klipschorn mains, a 2004 Belle Klipsch center, 2004 Klipsch RS-35 surrounds, and a ca. 1996 Velodyne S1500R subwoofer. This receiver makes them sing. It replaced a near-top of the line new Pioneer Elite VSX-52TX receiver (list $1000, paid $800)I tried that sounded dry, thin, antiseptic and spare and which I returned. I tried it also versus an older Onkyo TX-DS575 Dolby Digital receiver I had on hand that sounded similarly disappointedly. The 130 lacks all the bells and whistles that the Pioneer had, for example, automatic setup with a microphone. But it more than makes up in terms of listening quality, and at less than half the price. The remote stinks. Unlit, cluttered, small buttons, awkward. Receiver setup is not very easy, you will have to take your time with the manual, the remote and the receiver over several days or a couple of weeks to get everything dialed in nicely. But once you do, you're set. After setup, I solved the remote pronblem with a neat little Radio Shack (!) $30 illuminated learning remote that lets me control all the basic receiver and home theater functions nicely. So, don't let the awkward HK remote scare you away. 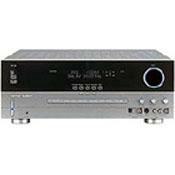 This modestly priced receiver is a real "sleeper" if you do not need more than a 5.1 setup. Very clean sound, easy to setup. Great sound, great price. I purchased over Sony and Yamaha. I like both of those, but the HK had much better imaging and was very clean, even at very high volumes. The sony and yamaha both left a little room for improvement at higher volumes. I was very happy with the price vs performance. Would highly recommend. Full rich detailed sound. No hint of overblown highs, mids or lows. Triple cross over Simple,logical DSP's (not overblown with such) Good power Excellent 5.1 reproduction Quickly responds to selected movie sound set up: DTS or Dolby minimum tweaking required. WOW!! I can't believe the change this Harman Kardon receiver made to my system. The Harman Kardon is replacing a Yamaha RX-V440 receiver whose sound was thin, unengaging and overly bright. I purchased the Yamaha with the intent of striking a balance between 2 channel stereo music and home theatre. The Yamaha produced poor 2 channel stereo with little or no imaging, and after the change to the Harman Kardon, I realized only passable home theatre sound. The difference in the two is amazing, and likewise amazing, is that both are considered "entry level"; the Harman Kardon is clearly on a different playing field. The Harman Kardon produces rich, full, detailed sound and provides the user with a host of useful tools to further tailor the sound. My speakers came alive and I find that I am fully engaged in the sound of my CD's and movies now. Bass augmentation is now on my terms rather than the receiver dictating to me when it is appropriate to use a sub. The Harman Kardon is clearly a "natural sounding" AV receiver that does everything it is supposed to do very well with authority and ease. Yamaha claimed "natural sound" or total audio purity however, it appears more to me as a schooled and practising musician, that the engineers of their products should get out of the labs, take a walk over to the musical instrument divisons side, and listen intently on how the instruments sound or should sound. Making good musical instruments does not necessarily ensure good quality stereo or av components I guess. I also understand AV receivers are built primarily for AV, however, I don't think it unreasonable to expect a system to do both 2 ch music and home theatre reasonably well. Besides, who wants a house filled with a bunch of electronics or who has the luxury of a home theatre room and stereo room while still maintaining a viable marriage or life partnership....try selling that one to your wife and partner who is looking for some new furniture :). The Harman Kardon permits both of us being happy and the bank was not broke in achieving this musical Nirvana with Harman Kardon. Yamaha requires a large jump in price, at least here in Canada, to achieve anything close to what the Harman Kardon produces. Thank you Harman Kardon for this receiver!! If you are looking to strike a balance between 2 channel stereo and home theatre then this is the receiver deserves your consideration. I returned a Pioneer 814 to CC to get this H/K AVR130, and it was a very good choice. This receiver blows the Pioneer away in every category. Though the Pioneer was easier to set up and configure and calibrate, the Harman/Kardon, once configured, sounds so much better. The H/K is a really warm and rich sounding receiver though only rated at 55 wpc X2 and 40 wpc X3, the unit is capable of enormous sound. But it is GOOD sound that is clean and accurate. Harman/Kardon makes it clear that they use what they call "honest ratings" on their equipment. The Pioneer I returned was 100 wpc, and my new H/K is 50, but blows the Pioneer away. I am completely sold on Harman/Kardon. I am really a bigger music than movie user, and this receiver gives you the flexibility to do either one very well. By the way, the looks of this receiver are so clean and fresh, that I doubt this receiver will ever age. It appears to have a timeless design that is very well put together. It seems very solid, as does the sound. I have no problem recommending this receiver. One issue I have is the less than perfect remote control design, but thats about it. Overall this is worth even twice the price. None. At this price, I like it as it is. This product produces clean, low distortion sound with a 50 x 2 and 40 x 5 channel power output. Very musical and detailed and brings out the best in my full Miller & Kreisel 750THS system. I was supposed to get the Harman AVR 33O. But was surprised to find out that the 130 sounded better than the 330 and provides a more convincing performance in both movies and music. Aside from higher wattage, the key advantage of the 330 is its 7.1 channel capability. If you're looking for a no frills 5-channel receiver at this price range, I suggest you consider this gear. Great price, easy to use fantastic sound. The AVR 130 will help your speakers reach their potential! I paid $500 Canadian. I bought this amp as well as an Onkyo in order to compare the two. I returned the Onkyo as soon as I heard my speakers going with the HK. To put it simply, my speakers (Polk Audio FXi50) achieved sounds that the Onkyo and my Dad's 10 year old Sony could not get them to do. Awesome clean and clear sounds and it never felt like there was a lack of power, in fact the opposite is true. I am very happy with this receiver and would recommend it.